The Bird Poker theme for this week is Blue and close up. I actually got an image on Thanksgiving day that fit the theme. 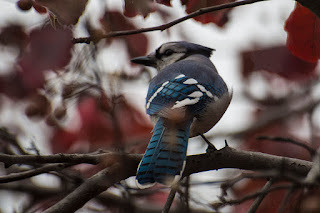 The Blue-jays were coming to feed at my in-law's home in Missouri. They were not very cooperative about having their photo taken but one sat for a bit in the Ornamental Pear tree so I was able to get a few shots. I do like the back view of them because it shows of the pattern of their feathers rather well so I was happy with what I got.